Deacon's Choosing Lunch and James Hamilton Smith's 50 year jubilee. James Hamilton Smith cutting his cake. This year's Deacon's Choosing Lunch was a very special occasion especially for Deacon Gary Smith as he was honoured by the presence of that great old stalwart, James Hamilton Smith also known as "Jimmy the Pie", Jimmy is no relation to Deacon Gary. Also in attendance was Deacon Convener Ruth Maltman and Collector of the House Alistair Dorward and many Past Deacons and friends of Jimmy the Pie. The Deacon's Choosing Lunch used to take place right after the Deacon had been chosen by the Masons and his lady would be made Queen of the Masons by the wearing of the Deacon's Chain. Due to the rush of the day and having to prepare for the Deacon's Choosing Dinner that same evening it had been decided a number of years before that the date of the Choosing Lunch would be moved to a few weeks later. 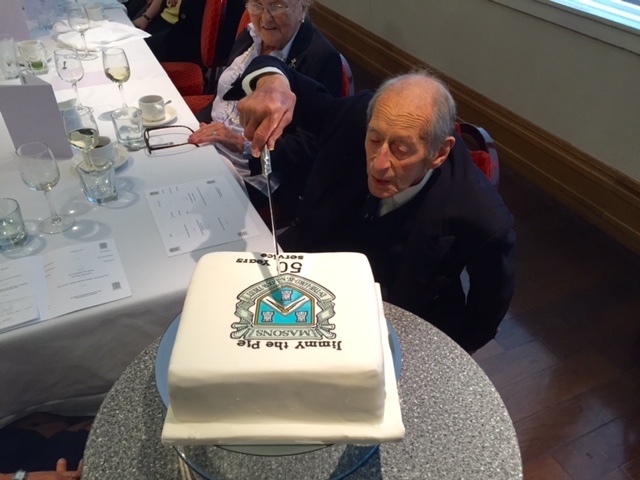 This year was obviously a special occasion as James Hamilton Smith had presided over this event 50 years ago when he was first elected as Deacon of the Masons in 1966. James had joined the Incorporation in 1948 and then went on to serve on the Master Court of the Incorporation since 1960 before taking on the highest office of his craft in 1966. For more years than most people can remember, James has been the Auldest and Most Senior Deacon in the Incorporation and as such has rapped the Shed at the end of numerous Incorporation functions. Click here to see James rap the shed. James' son Ian related tales about his father and how he had achieved the nickname "Jimmy the Pie". Apperently when he took a party of young rugby players to Musselburgh, after the game James enquired if they had any PIES, and on being informed that they had he duly ordered 15 pies and pints for the team. It was at this event that he achieved his now well known nickname. Another custom at the Deacon's Choosing Lunch is that the new members of the Master Court are seated at the corners of the table and are called New Laid Stanes. Jenny Kellie and John Brown were two such new members and they will becvome the foundation on which the Incorporation will build its future.